The perfect Bloody Mary every time. Enough spice for up to 30 Bloody Marys. Free from artificial flavours and colours. Perfect as a spicy marinade for meat & vegetables or to add a kick to your favourite dishes. Suitable for vegetarians.Bloody Mary spicer. THE BLOODY MARY, a classic drink enjoyed the world over for its refreshing, restorative powers. 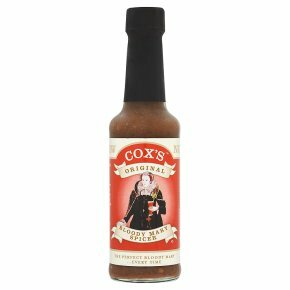 Cox's Original Bloody Mary Spicer is a harmonious blend of fifteen herbs, spices and other all-natural flavours blended to perfection in a unique recipe refined by generations of Bloody Mary lovers. Using only the finest natural ingredients, Cox's Original brings body, depth, and complexity to your Bloody Mary conveniently and consistently. Just add one teaspoon of Cox's Original Bloody Mary Spicer to tomato juice and vodka for the perfect Bloody Mary...every time.